The Continuity Forum provides a wide range of events geared to meet the needs of everyone from newcomers to experienced professionals. We have an unrivalled track record of success, built over the past 10 years, having delivered over 1000 events in the UK and internationally. Our Feedback scores from delegates is exceptional with over 93% of all attendees rating our sessions as very good or excellent. We offer both public and private "in-house" events and education split across a range of areas relevant to Business Continuity, Emergency Planning, Security Risk and Resilience. Our sessions are delivered in a variety of venues and in a mix of formats from Breakfast Briefings through to Complete multi-day Workshops. We work with diverse experts partners from a variety of backgrounds to ensure the quality and reliability of the content delivered is always world class. Our 'Getting Started' Sessions are structured to aid skills development and complements the timeline of internal BCM programmes development with sessions held regularly throughout the year. In-House, Professional and Expert events are customised to meet specific needs and are frequently used to aid the development of BCM in wider communities such as the Public Sector or Professional Groups. Our Briefing Events enable you to get world class support on most areas of the sector, delivered to your company and/or its partners in a highly effective format. 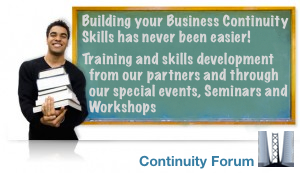 Public Sessions provide expert help and support on most Business Continuity, Security, Risk and Resilience topics. These sessions are ideal to promote awareness and promote engagement at national, regional and local levels. Frequently these events are held in conjunction with Public Sector bodies to meet the promotion requirements of the Civil Contingencies Act. For more details on our events, workshops and industry development work, as well as the general activities of the Continuity Forum please contact us directly on +44 208 993 1599 or mail us HERE!